The Sega Addicts Podcast records episode 34 tonight! The Sega Addicts will be recording their 34th episode later today. Just think, in 1,200 episodes from now we’ll be recording episode 1234. 1..2..3..4.. get it? Crazy, huh? Tonight’s episode will include: Sega news, a main discussion of franchises that went from 2D to 3D, listener questions, and so much more! If you’ve got some listener questions for us leave them in the comments below. We don’t even care if they’re relevant to the topics tonight! We’ll ask them regardless! Do you guys prefer completely 3D visuals (Sonic Adventure) or 2D/3D (Sonic 4) hybrid visuals? I’m a fag for Shining Force, but it didn’t do the game justice going 2d to 3d, but who am I trying to pull the wool over? None of these games EVEN Sonic didn’t do justice going 3d. Though for some reason I could go with HD remake of Toe Jam & Earl. – How do you feel about those 3d HDTVs? Anyone of you have any? – So how about some 3DS? How do you feel about that? And it’s selection of remade games? Please do tell what games ‘would’ you be getting. (Yes, I do think there are some titles that WILL be made for 3ds via SEGA). – Any of you played that Castlevania game for the PS3/XBox360? – Any other new (related) games that you’re gushing to get soon? As always, great to hear another awesome podcast, and it ‘would’ be nice to have some good ol’ Brit people join… Wot wot. =) Haha. Maybe I should play Sonic 4 though. Or at least wait till Episode 2. /shrug. Yeah…. uh, how about that Kinect? Going to get some Dance Central? Q1: Are you disappointed that Chakan: The Forever Man didn’t get a sequel, and instead the work put into the game was transferred to Blood Omen 2? 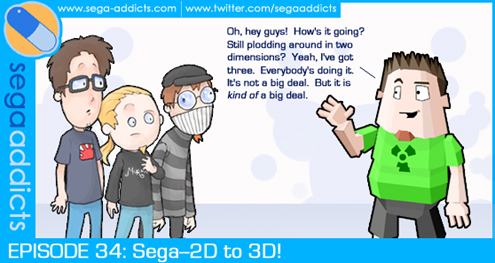 Q2: What old Sega game would you like to see made into 3D, and what additional features would you like to see in the game that would make the experience more enjoyable?